Sedna, near the constellation Cetus the Whale, was discovered shortly after a major astronomical event. This being ‘The Harmonic Concordance’, a very rare planetary alignment. The concordance provided the opportunity for detecting a new planet that was at its closest point to the sun. In astrology there are three categories of planets. The first consists of the planets visible to the naked eye. The second consists of the transpersonal planets, those outside of the visible planets. The third consists of the Great Year planets. Each category has its own unique characteristics. Category 1: defines the conscious personality. Category 2: describes the evolution of the soul. Category 3: describes the evolution of humanity over thousands of years and the precession of the equinoxes. 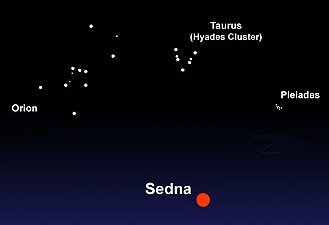 Sedna’s orbit is tracking the half cycle of the Great year which being on a cusp point for the evolution of humanity as it was and could be. Sedna has major implication for astrology and in the natal chart represents a manifestation of metaphysical energy. Sedna was in the sign of Aries from the late 1800’s to the mid 1960’s when it moved into Taurus where it will be until 2023 to 2024.